DALLAS, TEXAS (ANS – Oct. 19, 2018) — China is the most dangerous place for Religious Liberty. According to Sam Brownback, U.S. Ambassador at Large for International Religious Freedom, one of the most dangerous places in the world for religious liberty is China. 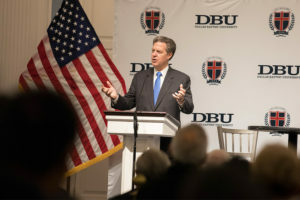 Brownback spoke on the role of the United States concerning international religious liberty at Dallas Baptist University on Tuesday night (Oct. 16). Speaking at the Institute for Global Engagement (IGE) at the University, Brownback highlighted the work the current administration is doing in regards to religious liberty around the world. He specifically highlighted the release of Pastor Brunson in Turkey and the recent Ministerial hosting at the State Department earlier this year. Brownback said the increasing usage of the political education camps in China among the Uyghur Muslims, coupled with the burning of Bibles and tearing down of crosses among Christians, is cause for alarm. Brownback noted the advancement of artificial intelligence. The technology in and of itself concerns the Ambassador. He also shared about developers’ potential willingness to export their technology to nations and entities around the world, which only adds to his growing concern. Before taking his current position, Brownback served as Governor of Kansas from 2011 to 2018 and as a U.S. Senator from Kansas from 1996 to 2011. Brownback noted how this role, at this time, was one of the most pivotal of his career. He shared a study conducted by Pew Research that indicated that eight in ten people on the planet live under a government that restricts religion in some form or fashion. While the U.S. does not proselytize individuals into one religion or another, it does champion an individual’s right to decide, being a fundamental right, Brownback said. Dr. Nick Pitts, Executive Director of the Institute for Global Engagement, shared how the evening’s lecture was a capstone to a remarkable day. He elaborated on the various meetings that took place during the day, sharing how organizations from across the Dallas area met on campus with Ambassador Brownback to share their concerns from their experiences within their work around the world. From South Sudan to China, a variety of entities gathered on the campus of Dallas Baptist University to share the global struggles of religious freedom. Pitts summed up the meetings to the crowd by quoting C.S. Lewis. “Aslan is on the move,” Pitts said, referencing the idea that the Christian God is working even in places where religion is being squelched out. In an online article from the University website, Pitts said the world is flooded with thoughts and opinions about everything imaginable, from political debates and racial tension to current diet trends and vaccinations. “Why, then, should believers engage in conversations about culture? How does a university like DBU do this without just becoming another voice in the sea of many?” he wrote. He writes that although these types of conversations take place throughout DBU, the primary way that the university seeks to engage in cultural conversation is by informing and providing opportunities for students to be educated. “Through the classrooms, professors engage students in discussion about culture on a daily basis and how the Bible speaks to such topics, while also allowing space for dialogue and questions. By providing resources beyond opinions, students develop their own convictions through the lens of a Biblical worldview,” Pitts said. On a larger scale, last fall, DBU began a lecture series called Veritas, led by Lee Bratcher, Director of the Master of Arts in International Studies and Coordinator of the Politics, Philosophy, and Economics, Program. This unique lecture series provides a space for thought leaders and industry professionals to discuss challenging and controversial topics with students. At the most recent Veritas event, Rwandan Ambassador Mathilde Mukantabana spoke on the topic of human rights. Later this month, Ed Dolanski, President of Boeing Global Services, will be discussing artificial intelligence and the future of warfare. Previous topics have included anxiety and depression, human flourishing, and more. DBU says that in the midst of what can feel like a tumultuous season in our culture, the university strives to provide Gospel-centered resources and perspectives on cultural topics for both students and the community at large. More resources along these lines will be available very soon. The Institute for Global Engagement is a Christian, non-sectarian think tank dedicated to addressing issues in the public square with biblical distinctiveness. The mission of the IGE is to be a moral and spiritual catalyst for renewal in our culture. Founded in 2015, the IGE values the biblical narrative, thoughtful consideration, and gracious civility. Dallas Baptist University is a nationally-ranked, liberal arts, global university, with a mission to produce servant leaders through the integration of faith and learning. DBU is home to more than 5,000 students, representing more than 60 countries around the world.